Kind of a neat looking lizard. Beautiful animal and great details Jim!! Nice shot. You can tell this guy has had his tail regenerated after a break-off. Thanks Steve, I did not notice the tail. Great shot! It's amazing that their tails can regenerate! Cool shot jj, is that some sort of a whiptail lizard? I've seen similar ones with a blue tail but not a blue face! Nice shot, JJ. 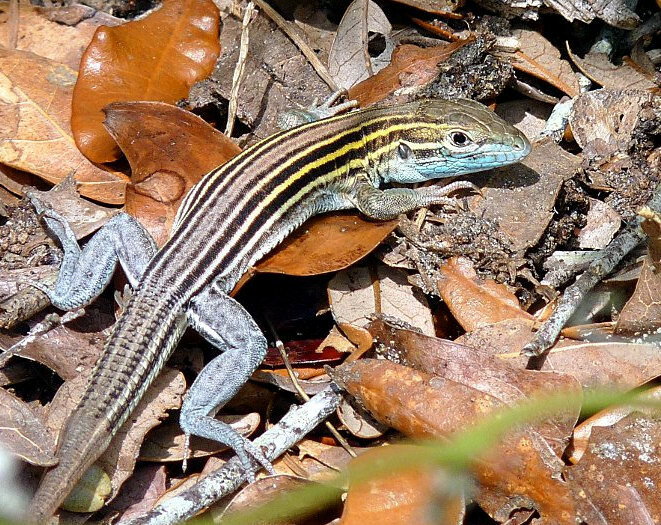 Six-lined whiptail Lizard, to be exact. We had these guys in Wichita Falls, then they followed me to Florida, when I moved here. Thanks Saly, glad you enjoyed. Robert said it was a six-lined whiptale. Thanks for the ID Robet. This was taken on the Outer Banks. Last edited by jjdog2; Jun 1, 2012 at 11:02 AM.